A C Cummings was appointed colonel, Provisional Army of Virginia, at Harpers Ferry, Jefferson County, Virginia, on 4 May, 1861. Second Lieutenant W H F Lee, 2nd United States Infantry, Company I, resigned on 30 April, 1861, and Captain W H F Lee, infantry, Provisional Army of Virginia, was ordered to Harpers Ferry, Jefferson County, Virginia, by Special Orders No.35, Headquarters, Virginia Forces, Richmond, Henrico County, Virginia, on 9 May, 1861. He was appointed major, Provisional Army of Virginia, on 17 July, 1861, and was appointed acting lieutenant colonel, 33rd Virginia Infantry, and mortally wounded at the first battle of Manassas on 21 July, 1861. Captain J R Jones, 33rd Virginia Infantry, Company I, was appointed lieutenant colonel, 33rd Virginia Infantry, on 21 August, 1861. First Lieutenant E G Lee, Provisional Army of Virginia, appears on a monthly report as aide de camp to the First Brigade, Army of the Shenandoah, under the command of Brigadier General T J Jackson, Confederate States Army, at Winchester, Frederick County, Virginia, dated 30 June, 1861, and was appointed major, 33rd Virginia Infantry, by Special orders No.234, Paragraph III, Headquarters, Virginia Forces, Richmond, Henrico County, Virginia, on 26 July, 1861, dated 27 July, 1861. The company was accepted in state service at Springfield, Hampshire County, Virginia, on 6 June, 1861, and was mustered in state service for one year at Parks' Valley, on the Northwestern Turnpike, two and a half miles west of Capon Bridge, on Cacapon River, Hampshire County, Virginia, on 17 June, 1861. The company was accepted in state service at Tom's Brook, Shenandoah County, Virginia, on 18 June, 1861, and was ordered to Winchester, Frederick County, Virginia, in the morning the same day. The company was mustered in state or Confederate service for one year at Winchester, Frederick County, Virginia, on 8 July, 1861, and First Lieutenant & Adjutant J F Neff, 33rd Virginia Infantry, was assigned to command the company during the first battle of Manassas as Captain E Crabill, 33rd Virginia Infantry, Company B, was sick on 21 July, 1861. Captain E Crabill, 33rd Virginia Infantry, Company B, resigned at Centreville, Fairfax County, Virginia, on 6 August, 1861, and First Lieutenant M Strickler, 33rd Virginia Infantry, Company B, was appointed captain, 33rd Virginia Infantry, Company B, on 29 August, 1861. The company was organised at Woodstock, Shenandoah County, Virginia, on 29 April, 1861, and was accepted in state service on 3 June, 1861. The company was ordered to Harpers Ferry, Jefferson County, Virginia, at 5 AM on 6 June, 1861, and arrived at Winchester, Frederick County, Virginia, at 5 PM the same day. The company was stationed at the Town Hall, Winchester, Frederick County, Virginia, on 6 June, 1861, and was ordered to proceed by the Winchester & Potomac Railroad to Harpers Ferry, Jefferson County, Virginia, at 8 AM on 7 June, 1861. The company arrived at Harpers Ferry via Charlestown, Jefferson County, Virginia, at 12 PM the same day and was assigned to the 10th Virginia Infantry on 7 June, 1861 (See the 10th Virginia Infantry). The company was assigned to the 33rd Virginia Infantry, Company C, at Neal's Dam, on Opequon Creek, three miles south of Winchester, Frederick County, Virginia, on 26 June, 1861, and was ordered to Hollingsworth's Mill, on the Valley Turnpike and Abra(ha)ms Creek, half a mile southwest of Winchester, Frederick County, Virginia, on 29 June, 1861. The company was mustered in Confederate service at Camp E K Smith, Hollingsworth's Mill, on Abrams Creek, west of the Valley Turnpike, half a mile southwest of Winchester, Frederick County, Virginia, on 12 July, 1861. The company was accepted in state service at Winchester, Frederick County, Virginia, on 10 May, 1861, and was assigned to detached duty in the vicinity of Winchester, Frederick County, Virginia, on 18 July, 1861. The company arrived at Camp Pickens, Manassas Junction, Prince William County, Virginia, on 23 July, 1861, and was mustered in Confederate service for one year on 26 July, 1861. The company was accepted in state service at New Market, Shenandoah County, Virginia, on 6 May, 1861, and was mustered in state service for one year on 1 June, 1861. The company was accepted in state service at Moorefield, Hardy County, Virginia, on 23 May, 1861, and was mustered in state service for one year at Winchester, Frederick County, Virginia, on 15 June, 1861. The company was accepted in state service at Mount Jackson, Shenandoah County, Virginia, on 18 May, 1861, and was mustered in state service for one year on 15 June, 1861. The company arrived by the Manassas Gap Railroad at Winchester, Frederick County, Virginia, on 20 June, 1861. The company was accepted in state service at Luray, Page County, Virginia, on 1 June, 1861, and was mustered in state service for one year on 19 June, 1861. The company arrived at Winchester, Frederick County, Virginia, on 20 June, 1861. The company was accepted in state service at Harrisonburg, Rockingham County, Virginia, on 22 June, 1861, and was ordered to Winchester, Frederick County, Virginia, on 1 July, 1861. The company was mustered in state or Confederate service for one year at Winchester, Frederick County, Virginia, on 11 July, 1861, and was assigned to guard a detachment of Federal prisoners (55) at Winchester, Frederick County, Virginia, on 18 July, 1861. The company was accepted in state service at Woodstock, Shenandoah County, Virginia, on 15 July, 1861, and arrived at Winchester, Frederick County, Virginia, on 16 July, 1861. Captain D H Walton, 33rd Virginia Infantry, Company K, was sick at Winchester, Frederick County, Virginia, on 18 July, 1861, and Second Lieutenant R Fadely, 33rd Virginia Infantry, Company K, was assigned to command the company during the first battle of Manassas on 21 July, 1861. "This morning ninety-six gallant and chivalrous looking volunteers from Luray, Page County, under the command of Capt. Young, left in the cars, and Capt, F. W. M. Holliday's Rifle Mountain Rangers will leave in a few days." "our company, the Shenandoah Riflemen, left for Winchester this morning. They number between sixty and seventy men, all of whom are quite expert with the gun, and good marksmen." "Two of the largest companies of the Thirty-third had been left in the Valley. The eight companies present were from Shenandoah, Page, Hampshire and Hardy (five were from Shenandoah, and one each from Page, Hardy and Hampshire); both the latter companies were small, about fifty men, so that deducting the sick and absent, there were only about 400 men in action. I was the only regular field officer in the regiment; but there was a Captain Lee, a splendid man and gallant officer, who had been temporarily assigned to the regiment and acted as field lieutenant colonel; he was in the charge, struck in the breast with a piece of shell and fell at his post mortally wounded, and died soon afterwards." "While his regiment was preparing to leave with the rest of Johnston's army, Holliday's company and Company I, the Rockbridge Confederates, were ordered to remain behind on detached duty." The 33rd Virginia Infantry was organised at Camp E K Smith, Hollingsworth's Mill, on Abra(ha)ms Creek, west of the Valley Turnpike, half a mile southwest of Winchester, Frederick County, Virginia, on 27 June, 1861. Mustered for one year, Hardy, Page, & Shenandoah Counties, Companies E, F, G, & H, 1, 15, & 19 June, 1861: The 33rd Virginia Infantry, Company E, was mustered in state service for one year on 1 June, 1861; Companies F and G for one year on 15 June, 1861; and Company H for one year on 19 June, 1861. Mustered for one year, Parks' Valley, on the Northwestern Turnpike, two & a half miles west of Capon Bridge, on Cacapon River, Hampshire County, Virginia, Company A, 17 June, 1861: The 33rd Virginia Infantry, Company A, was mustered in state service for one year at Parks' Valley, on the Northwestern Turnpike, two and a half miles west of Capon Bridge, on Cacapon River, Hampshire County, Virginia, on 17 June, 1861. Mustered for one year, Winchester, Frederick County, Virginia, Companies B & I, 8 & 11 July, 1861: The 33rd Virginia Infantry, Company B, was mustered in state or Confederate service for one year at Winchester, Frederick County, Virginia, on 8 July, 1861, and Company I for one year on 11 July, 1861. Mustered for one year, Camp E K Smith, Hollingsworth's Mill, on Abrams Creek, west of the Valley Turnpike, half a mile southwest of Winchester, Frederick County, Virginia, Company C, 12 July, 1861: The 33rd Virginia Infantry, Company C, was mustered in state or Confederate service for one year at Camp E K Smith, Hollingsworth's Mill, on Abrams Creek, west of the Valley Turnpike, half a mile southwest of Winchester, Frederick County, Virginia, on 12 July, 1861. Mustered for one year, rear between Blackburn's & Mitchell's Fords, on the Bull Run River, Company D, 26 July, 1861: The 33rd Virginia Infantry, Company D, was mustered in state or Confederate service for one year at the rear between Blackburn's and Mitchell's Fords, on the Bull Run River, on 26 July, 1861. Winchester, Frederick County, Virginia, Company D, 10 May-7 June, 1861: The Mountain Rangers was accepted in state service at Winchester, Frederick County, Virginia, on 10 May, 1861, and was stationed at Winchester, Frederick County, Virginia, between 10 May and 7 June, 1861. Note: Captain F W M Holliday, Mountain Rangers, arrested Brigadier General W S Harney, United States Army, at Harpers Ferry, Jefferson County, Virginia, on 26 April, 1861. New Creek (Station), Hampshire County, to Romney, Hampshire County, Virginia, Hampshire Riflemen, 21 May & 6 June, 1861: The New Creek Riflemen was reorganised as the Hampshire Riflemen at Romney, Hampshire County, Virginia, on 1 June, 1861, and First Lieutenant G F Sheetz, New Creek Riflemen, was appointed captain, Hampshire Riflemen, on 6 June, 1861 (See the 7th Virginia Cavalry). Note: Twenty-five men of the New Creek Riflemen, under the command of Captain E M Armstrong, arrived at Burlington, Hampshire County, Virginia, on 21 May, 1861, and was disbanded between 21 and 31 May, 1861. Woodstock, Shenandoah County, to Harpers Ferry, Jefferson County, Virginia, Company C, 6-7 June, 1861: The Tenth Legion Minutemen was ordered to Harpers Ferry, Jefferson County, Virginia, at 5 AM on 6 June, 1861, and arrived at Winchester, Frederick County, Virginia, at 5 PM the same day. The company was ordered to proceed by the Winchester & Potomac Railroad to Harpers Ferry, Jefferson County, Virginia, at 8 AM on 7 June, 1861, and arrived at 12 PM the same day. Note: The Tenth Legion Minutemen was assigned to the 10th Virginia Infantry at Harpers Ferry, Jefferson County, Virginia, on 7 June, 1861 (See the 10th Virginia Infantry). Baltimore & Ohio Railroad & Darkesville, Berkeley County, Virginia, Company D, 7 & 19 June, 1861: The Mountain Rangers was ordered to destroy the telegraph wire on the Baltimore & Ohio Railroad on 7 June, 1861, and was stationed at Darkesville, Berkeley County, Virginia, at 9 PM on 19 June, 1861. Springfield to Romney, Hampshire County, Virginia, Company A, 8 June, 1861: The Potomac Guards was accepted in state service at Springfield, Hampshire County, Virginia, on 6 June, 1861, and arrived at Romney, Hampshire County, Virginia, on 8 June, 1861. Harpers Ferry, Jefferson County, & Romney, Hampshire County, Virginia, Companies A & F, 16 May & 12 June, 1861: The Potomac Guards, the Independent Greys, the Hampshire Riflemen, the Bloomery Artillery, and a detachment of local citizens, under the command of Colonel A C Cummings, Provisional Army of Virginia, were stationed at Romney, Hampshire County, Virginia, on 12 June, 1861. Note: A C Cummings was appointed colonel, Provisional Army of Virginia, at Harpers Ferry, Jefferson County, Virginia, on 16 May, 1861, and the Bloomery Artillery was assigned one 12 pounder howitzer and one 6 pounder rifle which arrived from Harpers Ferry, Jefferson County, Virginia, on 7 June, 1861. Skirmish at Romney, Hampshire County, Virginia, Companies A & F, 12 June, 1861: The Potomac Guards and the Independent Greys, under the command of Colonel A C Cummings, Provisional Army of Virginia, were engaged in a skirmish at Cemetery Hill, one mile southwest of Romney, Hampshire County, Virginia, in the morning on 12 June, 1861. Note: Six companies of the 11th Indiana Infantry, under the command of Colonel L Wallace, were engaged skirmish at Cemetery Hill, one mile southwest of Romney, Hampshire County, Virginia, on 12 June, 1861 (See Unassigned, Army of Pennsylvania). Romney to Parks' Valley, on the Northwestern Turnpike, two & a half miles west of Capon Bridge, on Cacapon River, Hampshire County, Virginia, Companies A & F, 12–13 June, 1861: The Potomac Guards and the Independent Greys, under the command of Colonel A C Cummings, Provisional Army of Virginia, were ordered to withdraw to Winchester, Frederick County, Virginia, in the morning on 12 June, 1861, and were accompanied by the Hampshire Riflemen. The Potomac Guards and the Independent Greys arrived at Parks' Valley, on the Northwestern Turnpike, two and a half miles west of Capon Bridge, on Cacapon River, via Hanging Rock, Hampshire County, Virginia, on 13 June, 1861. Note: The Independent Greys was mustered in state service at Parks' Valley, on the Northwestern Turnpike, two and a half miles west of Capon Bridge, on Cacapon River, Hampshire County, Virginia, on 15 June, 1861, and the Potomac Guards on 17 June, 1861. Harpers Ferry, Jefferson County, to Romney, Hampshire County, Virginia, Company C, 13-18 June, 1861: The Tenth Legion Minutemen was ordered to Romney, Hampshire County, Virginia, as part of the 10th Virginia Infantry, on 13 June, 1861, and arrived at Winchester, Frederick County, Vir ginia, at 6 PM the same day. The company was ordered to proceed by the Northwestern Turnpike to Romney, Hampshire County, Virginia, at 4 AM on 17 June, 1861, and arrived at 11 AM on 18 June, 1861 (See the 10th Virginia Infantry). Note: The 10th Virginia Infantry, the 13th Virginia Infantry, and the 3rd Tennessee Infantry, under the command of Colonel A P Hill, 13th Virginia Infantry, were ordered to Romney, Hampshire County, Virginia, at 4 AM on 17 June, 1861, and arrived at 11 AM on 18 June, 1861. Parks' Valley, on the Northwestern Turnpike, two & a halff miles west of Capon Bridge, on Cacapon River, Hampshire County, Virginia, to Romney, Hampshire County, Virginia, Companies A & F, 18-19 June, 1861: The Potomac Guards and the Independent Greys were ordered to proceed by the Northwestern Turnpike to Romney, Hampshire County, Virginia, in the morning on 19 June, 1861, and were accompanied by the Hampshire Riflemen. The Potomac Guards and the Independent Greys arrived at Romney, Hampshire County, Virginia, arrived at 3 PM the same day and were assigned to Lee's Battalion Infantry, under the command of Captain W F Lee, Provisional Army of Virginia, on 19 June, 1861. Note: Lee's Battalion Infantry was temporarily assigned to the 13th Virginia Infantry at Romney, Hampshire County, Virginia, on 19 June, 1861. Tom's Brook, Shenandoah County, to Winchester, Frederick County, Virginia, Company B, 18 June, 1861: The Tom's Brook Guards or Shenandoah Riflemen was ordered to Winchester, Frederick County, Virginia, in the morning on 18 June, 1861. Luray, Page County, to Winchester, Frederick County, Virginia, Company H, 19-20 June, 1861: The Page Greys was ordered to Winchester, Frederick County, Virginia, on 19 June, 1861, and arrived on 20 June, 1861. Romney, Hampshire County, to Neal's Dam, on Opequon Creek, three miles south of Winchester, Frederick County, Virginia, Companies A, C, & F, 21-24 June, 1861: The Potomac Guards, the Independent Greys, as part of Lee's Battalion Infantry, and the Tenth Legion Minutemen, as part of the 10th Virginia Infantry, were ordered to proceed by the Northwestern Turnpike to Winchester, Frederick County, Virginia, on 21 June, 1861, and were accompanied by the Hampshire Riflemen, the 10th Virginia Infantry, the 13th Virginia Infantry, and the 3rd Tennessee Infantry. The Potomac Guards, the Independent Greys, and the Tenth Legion Minutemen, arrived at Hanging Rock, Hampshire County, Virginia, in the evening the same day and were ordered to Capon Bridge, on Cacapon River, Hampshire County, Virginia, at 3 PM on 22 June, 1861. The Potomac Guards, the Independent Greys, and Tenth Legion Minutemen were ordered to Hogue or Back Creek, west of Lockhart's Gap, Frederick County, Virginia, at 2 AM on 23 June, 1861, and arrived at 7 PM the same day. The Potomac Guards, the Independent Greys, and Tenth Legion Minutemen were ordered to Neal's Dam, on Opequon Creek, three miles south of Winchester, Frederick County, Virginia, at 7 AM on 24 June, 1861, and arrived the same day. Note: The Hampshire Riflemen was assigned to the 7th Virginia Cavalry, Company F, at Neal's Dam, on Opequon Creek, three miles south of Winchester, Frederick County, Virginia, on 25 June 1861, and was ordered to proceed by the Northwestern Turnpike to Romney, Hampshire County, Virginia, on 27 June, 1861 (See the 7th Virginia Cavalry). Darkesville, Berkeley County, to Winchester, Frederick County, Virginia, Company D, 26 June & 17 July, 1861: The Mountain Rangers was stationed at Darkesville, Berkeley County, Virginia, on 26 June, 1861, and arrived at Winchester, Frederick County, Virginia, on 17 July, 1861. Mount Jackson, Shenandoah County, to Hollingsworth's Mill, on Abra(ha)ms Creek, west of the Valley Turnpike, one mile southwest of Winchester, Frederick County, Virginia, Company G, 20 & 27 June, 1861: The Mount Jackson Rifles arrived at Winchester, Frederick County, Virginia, on 20 June, 1861, and was assigned to the 33rd Virginia Infantry, Company G, at Camp E K Smith, Hollingsworth Mills, on Abra(ha)ms Creek, west of the Valley Turnpike, one mile southwest of Winchester, Frederick County, Virginia, on 27 June, 1861. New Market, Shenandoah County, to Hollingsworth's Mill, on Abra(ha)ms Creek, west of the Valley Turnpike, one mile southwest of Winchester, Frederick County, Virginia, Company E, 27 June, 1861: The Emerald Guards was assigned to the 33rd Virginia Infantry, Company E, at Camp E K Smith, Hollingsworth's Mill, on Abra(ha)ms Creek, west of the Valley Turnpike, one mile southwest of Winchester, Frederick County, Virginia, on 27 June, 1861. Neal's Dam, on Opequon Creek, three miles south of Winchester, to Shawnee Springs, on Town Run or Creek, half a mile southeast of Winchester, Frederick County, Virginia, Companies A & F, 27 June, 1861: Lee's Battalion Infantry arrived at Camp Cummings, Shawnee Springs, on Town Run or Creek, half a mile southeast of Winchester, Frederick County, Virginia, on 27 June, 1861. Note: Lee's Battalion Infantry was temporarily assigned to the Fourth Brigade, Army of the Shenandoah, under the command of Colonel A Elzey, 1st Maryland Infantry, at Camp Cummings, Shawnee Springs, on Town Run or Creek, half a mile southeast of Winchester, Frederick County, Virginia, on 27 June, 1861 (See the Fourth Brigade, Army of the Shenandoah). Neal's Dam, on Opequon Creek, three miles south of Winchester, to Hollingsworth's Mill, on Abra(ha)ms Creek, west of the Valley Turnpike, one mile southwest of Winchester, Frederick County, Virginia, Company C, 29 June, 1861: The Tenth Legion Minutemen, 10th Virginia Infantry, was assigned to the 33rd Virginia Infantry, Company C, at Neal's Dam, on Opequon Creek, three miles south of Winchester, Frederick County, Virginia, on 26 June, 1861, and arrived at Camp E K Smith, Hollingsworth's Mill, on Abra(ha)ms Creek, west of the Valley Turnpike, one mile southwest of Winchester, Frederick County, Virginia, on 29 June, 1861. Note: The 33rd Virginia Infantry, Companies C, E, G, and H, were stationed at Camp E K Smith, Hollingsworth's Mill, on Abra(ha)ms Creek, west of the Valley Turnpike, one mile southwest of Winchester, Frederick County, Virginia, under the command of Colonel A C Cummings, Provisional Army of Virginia, on 30 June, 1861. Harrisonburg, Rockingham County, to Winchester, Frederick County, Virginia, Company I, 1 & 11 July, 1861: The Rockingham Confederates was ordered to Winchester, Frederick County, Virginia, on 1 July, 1861, and was mustered in state service on 11 July, 1861. Camp Cummings, Shawnee Springs, southeast of Winchester, Frederick County, to Darkesville, Berkeley County, Virginia, Companies A & F, 2-5 July, 1861: Lee's Battalion Infantry was ordered to proceed by the Martinsburg Turnpike to Darkesville, Berkeley County, Virginia, at 12 PM on 2 July, 1861, and arrived via Bunker Hill, Berkeley County, Virginia, at 10 AM on 3 July, 1861. Darkesville, Berkeley County, to Shawnee Springs, southeast of Winchester, Frederick County, Virginia, Companies A & F, 5 July, 1861: Lee's Battalion Infantry was ordered to Shawnee Springs, on Town Run or Creek, half a mile southeast of Winchester, Frederick County, Virginia, on 5 July, 1861. Camp E K Smith, Hollingsworth's Mill, on Abra(ha)ms Creek, west of the Valley Turnpike, one mile southwest of Winchester, Frederick County, to Darkesville, Berkeley County, Virginia, Company E, 4 & 7 July, 1861: The 33rd Virginia Infantry, Company E, was assigned to guard commissionary stores on the Martinsburg Turnpike at Darkesville, Berkeley County, Virginia, at 12 AM on 4 July, 1861, and arrived at 7 AM the same day. Company E arrived at Camp E K Smith, Hollingsworth's Mill, on Abra(ha)ms Creek, west of the Valley Turnpike, one mile southwest of Winchester, Frederick County, Virginia, at 1 PM on 7 July, 1861. Camp E K Smith, Hollingsworth's Mill, on Abra(ha)ms Creek, west of the Valley Turnpike, one mile southwest of Winchester, Frederick County, Virginia, Company C, 5 July, 1861: The 33rd Virginia Infantry, Company C, arrived at Camp Cummings, Shawnee Springs, on Town Run or Creek, one mile southeast of Winchester, Frederick County, Virginia, on 5 July, 1861. Camp Cummings, Shawnee Springs, on Town Run or Creek, one mile southeast of Winchester, to Hollingsworth's Mill, on Abra(ha)ms Creek, west of the Valley Turnpike, one mile southwest of Winchester, Frederick County, Virginia, Company C, 8 July, 1861: The 33rd Virginia Infantry, Company C, was ordered to Hollingsworth's Mill, on Abra(ha)ms Creek, west of the Valley Turnpike, one mile southwest of Winchester, Frederick County, Virginia, on 8 July, 1861. Camp Cummings, Shawnee Springs, on Town Run or Creek, one mile southeast of Winchester, to Hollingsworth's Mill, on Abra(ha)ms Creek, west of the Valley Turnpike, one mile southwest of Winchester, Frederick County, Virginia, Companies A & F, 12 July, 1861: Lee's Battalion Infantry was assigned to the 33rd Virginia Infantry, Companies A and F, at Camp E K Smith, Hollingsworth's Mill, on Abra(ha)ms Creek, west of the Valley Turnpike, one mile southwest of Winchester, Frederick County, Virginia, on 12 July, 1861. Note: The 33rd Virginia Infantry, Companies B, C, E, G, and H, were stationed at Camp E K Smith, Hollingsworth's Mill, on Abra(ha)ms Creek, west of the Valley Turnpike, one mile southwest of Winchester, Frederick County, Virginia, under the command of Colonel A C Cummings, Provisional Army of Virginia, on 12 July, 1861. Camp E K Smith, Hollingsworth's Mill, on Abra(ha)m Creeks, west of the Valley Turnpike, one mile southwest of Winchester, to the Shenandoah Valley Agricultural Society Fairgrounds, one mile northwest of Winchester, Frederick County, Virginia, Companies A, B, C, E, F, G, & H, 15 July, 1861: The 33rd Virginia Infantry, Companies A, B, C, E, F, G, and H, were ordered to the Shenandoah Valley Agricultural Society Fairgrounds, one mile northwest of Winchester, Frederick County, Virginia, at 9 AM on 15 July, 1861. Note: The 33rd Virginia Infantry was assigned to the First Brigade, Army of the Shenandoah, under the command of Brigadier General T J Jackson, Confederate States Army, at Camp Johnston, Shenandoah Valley Agricultural Society Fairgrounds, one mile northwest of Winchester, Frederick County, Virginia, on 15 July, 1861. Woodstock, Shenandoah County, to the Shenandoah Valley Agricultural Society Fairgrounds, one mile northwest of Winchester, Frederick County, Virginia, Company K, 16 July, 1861: The Shenandoah Sharpshooters arrived at Camp Johnston, Shenandoah Valley Agricultural Society Fairgrounds, one mile northwest of Winchester, Frederick County, Virginia, on 16 July, 1861. Note: Major L Lutz, 146th Virginia Militia (Shenandoah County), was appointed first lieutenant, Shenandoah Sharpshooters, on 15 July, 1861, but failed to report for duty between 15 and 18 July, 1861. 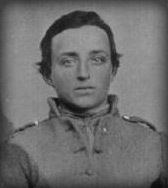 G W Buck was appointed first lieutenant, 33rd Virginia Infantry, Company K, at Farifax Courthouse, Fairfax County, Virginia, on 21 September, 1861 (See the Virginia Militia). The 33rd Virginia Infantry was ordered to Manassas Junction, Prince William County, Virginia, by Special Orders No.1, Headquarters, Army of the Shenandoah, Winchester, Frederick County, Virginia, at 1 AM on 18 July, 1861, dated 17 July, 1861. Note: The organisation of the 33rd Virginia Infantry was not completed and undesignated on 17 July, 1861, and was temporarily known as Cummings' Regiment during the first battle of Manassas on 21 July, 1861. The Mountain Rangers and the Rockingham Confederates were assigned to detached duty at Winchester, Frederick County, Virginia, on 18 July, 1861. Camp Johnston, Shenandoah Valley Agricultural Society Fairgrounds, one mile northwest of Winchester, Frederick County, to Piedmont Station, Fauquier County, Virginia, 18-20 July, 1861: The 33rd Virginia Infantry, Companies A, B, C, E, F, G, H, and K, were ordered to proceed by the Millwood Turnpike to Piedmont Station, Fauquier County, Virginia, at 12 PM on 18 July, 1861, and arrived at Berry's Ferry, on the Shenandoah River, three and a half miles southeast of Millwood, Clarke County, Virginia, at 9 PM the same day. Companies A, B, C, E, F, G, H, and K arrived at Paris, Fauquier County, Virginia, via Ashhby's Gap at 1 AM on 19 July, 1861, and was ordered to Piedmont Station, Fauquier County, Virginia, at 3 AM same day. The 33rd Virginia Infantry, Companies A, B, C, E, F, G, H, and K, arrived at Piedmont Station, Fauquier County, Virginia, at 6 AM on 19 July, 1861. Note: The 33rd Virginia Infantry (27/55), Company A, was ordered to Manassas Junction, Prince William County, Virginia, at 12 PM on 18 July, 1861. Piedmont Station, Fauquier County, to Manassas Junction, Prince William County, Virginia, 19-20 July, 1861: The 33rd Virginia Infantry, Companies A, B, C, E, F, G, H, and K, were ordered to proceed by the Manassas Gap Railroad to Manassas Junction, Prince William County, Virginia, at 4 PM on 19 July, 1861, and arrived at Camp Pickens, Manassas Junction, Prince William County, Virginia, at 1 AM on 20 July, 1861. The regiment was ordered to the rear between Blackburn's and Mitchell's Fords, on the Bull Run River, at 8 AM on 20 July, 1861. Note: The 33rd Virginia Infantry was stationed at the rear between Blackburn's and Mitchell's Fords, on the Bull Run River, as support to the First Brigade, Army of the Potomac, on 21 July, 1861. Winchester, Frederick County, to Manassas Junction, Prince William County, Virginia, Company I, 18 & 23 July, 1861: The 33rd Virginia Infantry, Company I, was assigned to guard fifty-five Federal prisoners at Winchester, Frederick County, Virginia, on 18 July, 1861, and arrived at Camp Pickens, Manassas Junction, Prince William County, Virginia, on 23 July, 1861. Note: A detachment of the 33rd Virginia Infantr (16), Company I, under the command of First Lieutenant G C Eastham, was ordered to accompany Federal prisoners to Richmond, Henrico County, Virginia, on 18 July, 1861, and arrived at Camp Pickens, Manassas Junction, Prince William County, Virginia, between 27 July and 2 August, 1861. After the first battle of Manassas the 33rd Virginia Infantry, Companies A, B, C, E, F, G, H, and K, were ordered to the rear between Blackburn's and Mitchell's Fords, on the Bull Run River, in the evening on 21 July, 1861. Note: The 33rd Virginia Infantry, Company D, was stationed at the rear between Blackburn's and Mitchell's Fords, on the Bull Run River, on 26 July, 1861. Rear between Blackburn's & Mitchell's Fords, on the Bull Run River, to Flat Run, three miles northwest of Manassas Junction, Prince William County, Virginia, 27 July, 1861: The 33rd Virginia Infantry arrived at Camp Maggot, on Flat Run, three miles northwest of Manassas Junction, Prince William County, Virginia, in the morning on 27 July, 1861. Camp Maggott, on Flat Run, three miles northwest of Manassas Junction, Prince William County, to Centreville, Fairfax County, Virginia, 2 August, 1861: The 33rd Virginia Infantry arrived at Camp Harman, one mile east of Centreville, Fairfax County, Virginia, on 2 August, 1861. Note: The 33rd Virginia Infantry was stationed at Camp Harman, one mile east of Centreville, Fairfax County, Virginia, on 31 August, 1861. Reorganised at Conrad's Store, on Elk Run Creek, Rockingham County, Virginia, 23 April, 1862: The 33rd Virginia Infantry was reorganised at Conrad's Store, on Elk Run Creek, Rockingham County, Virginia, on 23 April, 1862. Surrendered at Appomattox Courthouse, Appomattox County, Virginia, 9 April, 1865: The 33rd Virginia Infantry, under the command of Captain H A Herrell, surrendered at Appomattox Courthouse, Appomattox County, Virginia, on 9 April, 1865. The 33rd Virginia Infantry was assigned to the First Brigade, Second Corps, Army of the Shenandoah, under the command of Brigadier General T J Jackson, Confederate States Army, on 25 September, 1861.